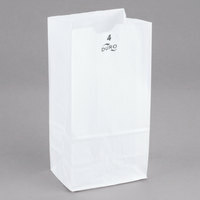 These plain white paper bags will give your valuable products the reliable protection that they need and deserve! They are perfect for efficiently distributing your smaller products such as bagels, sandwiches, and other delicious pastries. A white paper bag folds open easily, and can hold up to 4 lb. We go through a lot of these bags at our bakery/sandwich shop! They are a good quality paper, sturdy enough to hold up when being loaded with small sandwiches or pastries. Some of the bags are sometimes defective and have a hole in the bottom when opened, but not very many are totally unusable when compared to how many come in a pack. Great price too! i looveee this white paper bags because it give a clean looking, sturdy, easy to open and fold, nice sized bags. Use them with paper towel to catch grease! i am satisfied with this great lunch bags! This is your typical bakery bag. We use every day to serve muffins and other bakery items. No complaints about these. They work great and are a great price! These are your standard white paper pastry bags -- nothing to complain about! Will fit 1 or 2 small muffins or pastries. Nicer looking than plastic baggies, and better for the environment. Great bags! They serve many purposes at my coffee shop. We always make sure we have plenty of in stock. They're pretty big and can hold a lot! Would be the perfect size for someone who packs a lunch as well. We purchased these bags for our restaurant. We use them for our tortilla chips when they are ordered to go. They are holding up just fine. Great bag for when people order just one or two items. white bags are the best for serving up greasy food like frys and such! We use these bags for snacks and treats in our café, they are pretty sturdy and the perfect size for smaller snacks and food items! Great white paper bags by Duro. These hold up to 4 pounds so they easily accommodate a sack lunch or take out order. Plain white allows easy customization. I have a small bakery, Pie First Bakery, and I chiefly sell pies, tarts, cookies, muffins and scones at our local Farmers' Market. I use these white paper bags to package up the cookies, muffins and scones, and they are a perfect size. They are also durable and easily hold up with a moist scone, jumbo cookie, or extra-large muffin with streusel topping! This bag is perfect for lightweight items. We use it for to-go items like waffles, cookies, donuts, and pudding containers, and it holds up well. Great white paper bags. We use these for all of our bakery products and they are a good quality, hold up well, and are a simple bag. Size and price are great as well. These bags are so affordable and good quality, stamped them for my daughter’s wedding to use for popcorn and snacks for guests to take home! What a nice bag for take out orders. Very sturdy and doesn't tear when being properly handled. It does absorb a lot of grease though. Great bags for your customers. The thickness is good to fold over the top or for the customers to carry. Ideal size for a couple of items (depending on the size, could be more). Perfect !!!!! We use this white paper bag in our French bakery for our croissants. The size is perfect for, for exemple one croissant or two chocolate croissants. These bags are great, a little heavier than the thin brown paper bags. Very easy to customize with stamps, paint, or ribbon. There is no shortage of ideas these bag can be used for. We love these bags! The option for a white bakery bag in place of a brown bag adds a touch of class. They are sturdy and can hold multiple items! Good bag for what I bought them for. They will hold about 4 bars of soaps for customers, without stacking the product up. So, great for small orders or for single scents in an order. These are smaller bags but they are still strong. They easily hold cookies, brownies or multiple baked goods of that size. They don't rip down the sides either. They're strong enough for what I need. Good bag for purpose. We are using for donuts and cookies as needed. Works well for about 3 donuts at a time and holds quite a few donut holes. Bag sturdy and looks nice. These are great for small snacks, cookies or a couple regular size muffins. The white is great because not only does it have a very clean look but depending on what you're using these for you can embellish them easily for different seasons or events. Great size bags that fit my deli storage containers or even burgers and sandwiches. great price for these bags for take out orders. Recommend this product. Great to go bags. Sturdy and look great too. We customize them by putting our address labels on them. Sometimes we write thank you notes to our customers on them and they love that. A good all purpose bag. Our local wholesaler no longer carries this size, so I was glad to find these and the quality is better, too. we use this white paper bag for our to go scones, muffins, cookies and even frozen pasties. very nice material and it doesn't break fast. this 4 pound white paper bag is a really clean and nice looking bag. and at 500 per bundle its a super good value. the customers really like the look and feel of the bag. We use these bags at our cafe for pastries and to-go soups. They are perfect for a bagel, or pastry, or cup of soup. Sometimes we have issues with there being too much glue and the bag is stuck together, or too little, and the bottom isn't sturdy. This is rare though! bags work good but grease can get through it some times .for the price they are good but not the best they also fold open easily.. These bags are great for bagging up small styrofoam containers of leftovers! They are even strong enough to hold french fries for take out orders!! We haul junk from homes and businesses and compete with many other companies in the market. To differentiate ourselves we give each customer a small bag of freshly baked (Otis Spunkmeyer) cookies in one of your crisp white bags. They look great and are exactly the right size and shape. These bags are a perfect size for a hot dog and fries. They are good bags, but I wouldn't wet them. Single use only for these. This size is perfect for most of our individually packaged items. It is an essential item that will always be needed for packaging. Great price also. These didn't seem like they were going to work well for my items but they are sturdier than we had thought at first. Will work well and I will order more in the future!